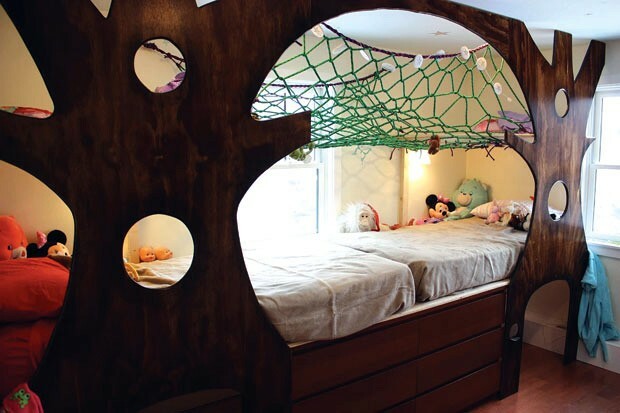 Tree-House Bedroom | Habitat | Kids VT - small people, big ideas! In 2010, Adam Hadlock built his girls a tree house for Christmas — in their shared bedroom at his home in Sharon. He sketched a design one day while at his job as a systems administrator and bought the materials on the way home from work. When the girls were visiting their mother for a few days before the holiday, he started construction. To save floor space, he raised their beds and put a new Ikea dresser underneath. The rest of the area under the beds became a cave, which he decorated with a string of Christmas lights. He used furniture-grade plywood to make the "trees," which enclosed the beds in a cozy corner. While the required coats of stain and polyurethane were drying, he wove the hammock out of climbing rope, using YouTube videos as a guide, and installed it above the beds. For Hadlock, who had never woven anything, that was the most perplexing part of the project. He finished the whole thing in two and a half days — just in time for Christmas — and spent about $150, not including the dresser and the mattresses. Three years later, the bedroom that was a holiday hit when Shannon and Addison were 5 and 7 is still their favorite nook for reading, snuggling with stuffed critters and hanging out with sleepover pals. Tree-trunk bed and platform supports are fun and functional. Dresser fits beneath the bed, conserving floor space. Crawlspace under the beds provides storage or a cozy play space. Hammock above the beds is great for relaxing — or storing stuffed animals.